This is not only an act of purification but also an act or worship. As Muslims we try to perform the Wudoo in the same way that the Prophet (PBUH) did. The preferred way of doing the Wudoo is described below. See the video clips on the right as well for details. The bare-minimum requirements for the wudoo are in bold and must be performed in this sequence as these are ordained as such in the Quran. While fulfilling these minimum requirement will give you a valid wudoo, it is preferable to perform it in the manner of the Prophet (PBUH) as described below. 11. Finish by saying the Shahaadah* (click here to learn and practice the words to the Shahaadah). Wiping Over Socks: If you put on socks while you are still in the state of ritual purity, you do not have to take off your socks to wash your feet during Wudoo again for 24 hours. Instead you can wipe a wet hand over your socks, starting from the toes to above the ankles, first on the right foot and then the left foot. 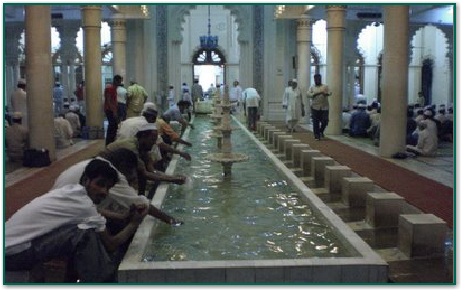 If for some completely unavoidable reason (see below) one is unable to use water for wudoo or ghusl, it is allowed to do Tayammum or dry ablution. Tayammum is valid if done using anything that comes from the face of the earth, such as dust, mud, rocks, sand and clay. 4. wipe the face with both hands.